Nutritech Testogrowth NXT is a natural night time testosterone booster. Optimal levels of testosterone build muscle and burn fat. Natural testosterone levels in men start to decrease after the age of 25. Lifestyle choices, stress, overtraining and environmental factors may decline testosterone levels even further. Healthy testosterone in men has been linked to energy, strength, lean muscle, sexual desire and performance. Has been formulated with a precise blend of 10 testosterone supporting ingredients, including 1000 mg of d-aspartic acid and 500 mg of tribulus terrestris per single serving. The ingredients work together with your body to stimulate natural production to optimal levels. This product includes clinically tested ingredients. Evidence suggests that Zinc plays a central role in the regulation of cellular growth and tissue repair. Magnesium is essential for the maintenance of electrolyte balance, energy production and normal neuromuscular function. 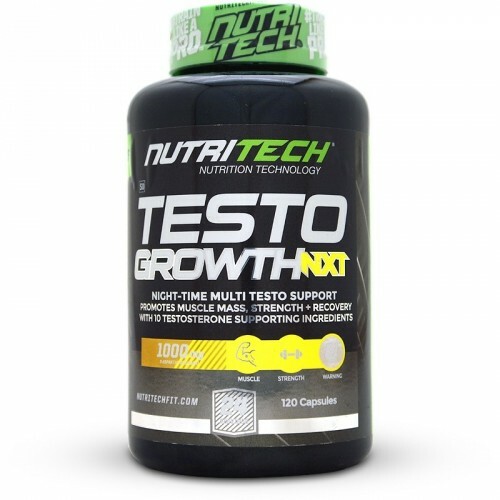 The formulation of Nutritech Testogrowth NXT is a comprehensive testosterone boosting supplement to assist with lean muscle and male performance. * Nutrient Reference Values (NRVs) for individuals from the beginning of 37 months and older expressed per single serving. Peruvian Ginseng, Piperine 95%, D-Aspartic Acid, Coleus Forskoli, Chrysin, Fenugreek Extract, Tongat Ali, Tribulus Terrestris, Vitamin B-6 (as Pyridoxine Hydrochloride), Zinc (as Zinc Monomethionine), Magnesium Stearate, Silicon Dioxide, Capsule Shell (Gelatin, Purified water, Colourant). • For best results, avoid taking with dairy or other calcium-containing products. If you suffer from high blood pressure and are using medication to control blood pressure consult with your healthcare practitioner before using this product. Diabetics should consult their healthcare practitioner before using this product. If you have a history of benign prostatic hypertrophy or prostate cancer avoid using this product. If you are using medication for blood thinning, such as warfarin, use this product under the supervision of your healthcare practitioner. Discontinue use of this product at least 2 weeks prior to any planned surgical procedure. Always tell your health care professional if you are taking other medicine. If you are pregnant or breastfeeding your baby please consult your doctor, pharmacist, or other health care professional for advice before taking this medicine. This product may interact with the effectiveness of the oral contraceptive pill. Discontinue the use of this product where there is sensitivity towards any of the ingredients. Patients who are allergic to other Fabaceae plants including soybeans, peanuts, and green peas might also be allergic to fenugreek.